The Cthulhu Hack is a tabletop role playing game of investigative cosmic horror set against the backdrop of the universe Howard Lovecraft created in his classic stories. While the Cthulhu Mythos has expanded significantly in the century since his tales first went to print, The Cthulhu Hack draws on that original source material, which you can freely download in all its public domain completeness in ePub and Mobi format (thanks for format to @cthulhuchick at ArkhamArchivist.com under CC BY-NC 3.0 credit to Squid Studios). At heart, The Cthulhu Hack provides a simple framework of mechanics to support investigative storytelling. A lot of other games have done similar, including the venerable Call of Cthulhu (from Chaosium) and Trail of Cthulhu (from Pelgrane Press), but Cthulhu Hack boils the mechanical crunch right down to two basic mechanics – Saves and Resources. Both involve throwing one or other of a standard die from a set of polyhedral dice – you’ll need everything from a four-sided through to a twenty-sided. And the players get pretty much all the dice rolling fun – so they’re the instruments of their own doom. Everything you do in the game that involves a dice roll involves either Threat or Resource, and The Cthulhu Hack uses these in interesting ways. For example, your characters ability to find clue depends on two Resources – Flashlights and Smokes. Instead of a long list of skills, you have just two dice to do everything from spotting the hidden and researching in a library to bribing a guard and knocking back sociable pints in a local pub. It not only means a simple game to teach new players, it also makes it very easy to convert adventures from other systems on-the-fly. 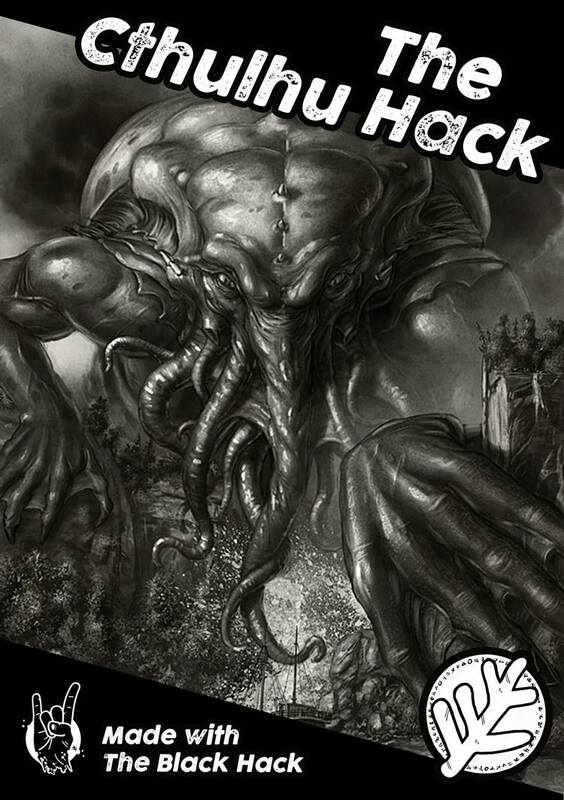 You can probably read The Cthulhu Hack in 20 minutes, explain it in 5 minutes and have characters ready on the table before you’ve used up another 5! Half an hour from picking up the book to playing the game with friends as investigators into the unknown fighting cosmic horror and nefarious sects of obscure unearthly beliefs. No previous experience of the Cthulhu Mythos required, as the back of the book includes a three-page Mythos 101 for those unfamiliar with the original tales. And, “Ordinary people dragged into strange and supernatural situations certain to test mind, muscle and mettle,” covers the rest. Check out an example of adventure conversion of The Haunting. No previous experience of the Cthulhu Mythos required! Includes a Mythos 101 for those unfamiliar with the original tales. Available from RPGNow, DriveThruRPG, Lulu and All Rolled Up.